In 2012, I became acutely aware of Thomas when I heard him perform his song ‘The Moment’ on Radio New Zealand. As I listened to the interview and his rendition of ‘Cocaine Blues’, I knew I had to make him a steel string guitar to accompany him and his Tony Francis Weissenborn. In 2014, I made contact with Thomas and he was enthusiastic about the project, so we began designing his now signature model from scratch. The basis of everything was tone; strong, lush bass, clean and articulate mid-range, with sweet sparkling treble. By 2016, the guitar was under construction. We developed the shape from my OM by tweaking the template until we had a full 16’’ lower bout like a dreadnought. 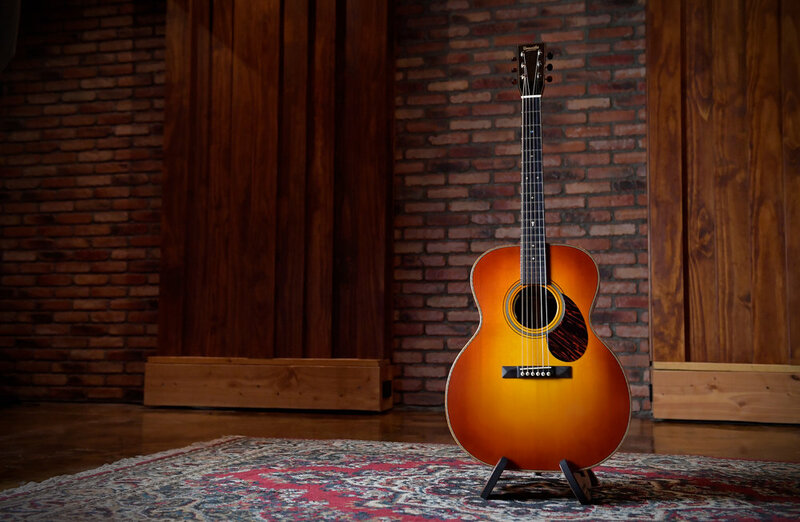 The body made of Adirondack spruce and Cocobolo back and sides made for an ultra-responsive and dynamic guitar, perfect for Thomas’s versatile and expressive music. In November that year, he was nominated and awarded the APRA Silver Scroll award for his song ‘If I Move To Mars,’ and we decided to incorporate a few special inlays for the fret board, developed the unique ‘Mars Burst’ shade for the top, and hunted down the perfect red stripe pick guard to compliment the Cocobolo. The final touch was the Waverly tuning machines with Snake Wood buttons to match the New Zealand grown Black Acacia binding. Early 2017, the guitar was ready to take off, and Thomas made the trip all the way up to my home in Ahipara to check it out. He sat down with my family and I in our living room and looked the guitar up and down with a hungry grin from ear to ear. After a moment, he began to fill our 100 year old Rimu villa with Keb Mo’s ‘Perpetual Blues Machine’ on what was to be the first prototype of this guitar. After hours of playing and discussion, we decided that there were no changes we wanted to make to the design, so Thomas took the guitar on tour to promote his new album, and we proudly added the Thomas Oliver Signature Model to the Benavides Guitars production line.